Tank overfill is a crucial safety concern in the petroleum industry. Failure to put adequate prevention measures in place has resulted in injuries, loss of life, and billions of dollars worth of damages worldwide. 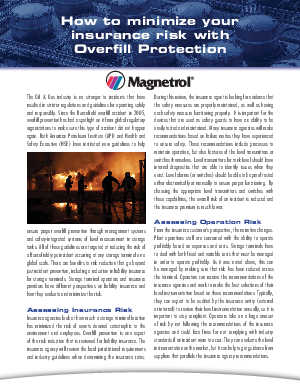 These resources were developed by the level control experts at Magnetrol to help you implement and maintain an effective Overfill Protection Plan for your terminals. Simply click on the downloads below at the Resources section to access this important information. If you have a question on level instruments for overfill protection or if you would like to be contacted directly, just fill in the form on your right and we'll be in touch within a few business days.